Visualise yourself visiting a location on a frozen pasture on the Nemunas Delta, accompanied by Alan Hewitt & Boris Belchev, with both singular birds & groups of 14-16 White-tailed Sea Eagles gathering in front of the photography hide in which you are sited. 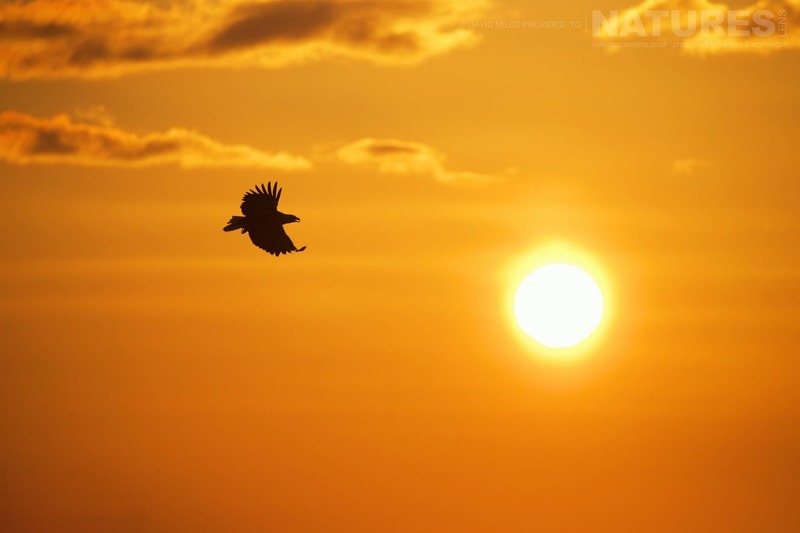 Your photographic opportunities are both abundant & presented directly in front of you; that is the nature of this White-tailed Sea Eagles of Lithuania Photography Holiday: seeing congregations of eagles is undoubtedly one of the highlights of the natural world. The White-tailed Sea Eagles are not too wary of the hides, & due to the quantities that are attracted by the additional food that is placed out for them, they feel secure & will spend time in front of the hides, feeding, fighting, posing & more. The eagles vary in maturity & consequently behaviour, with the range from juvenile, through sub adult, to the awe-inspiring adult birds. 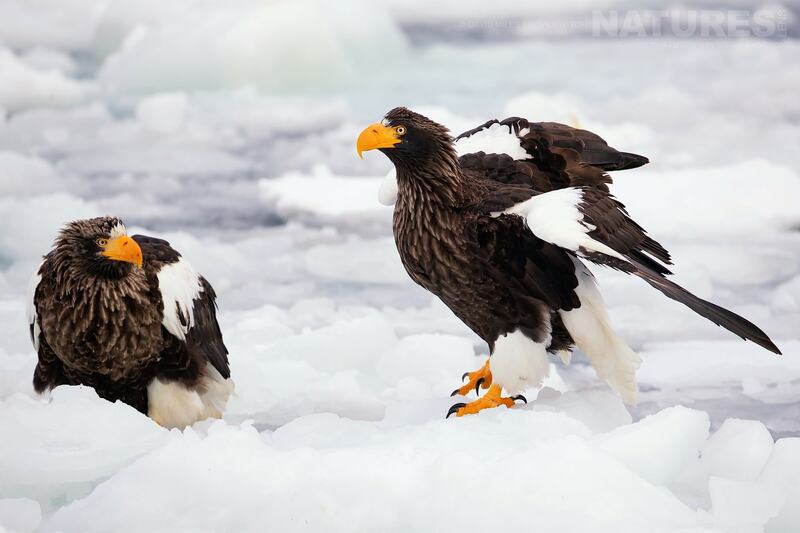 Join NaturesLens to capture images of the fabulous White-tailed Sea Eagles, in Lithuania, during the White-tailed Sea Eagles of Lithuania photography holiday. This photography holiday is of day duration on a Full Board, Non-Shared basis & costs £1199 £1049 per participant. The Nemunas Delta has a good breeding population of approximately 50 pairs of White-tailed Sea Eagles, &, generally, there are plenty of birds to photograph. 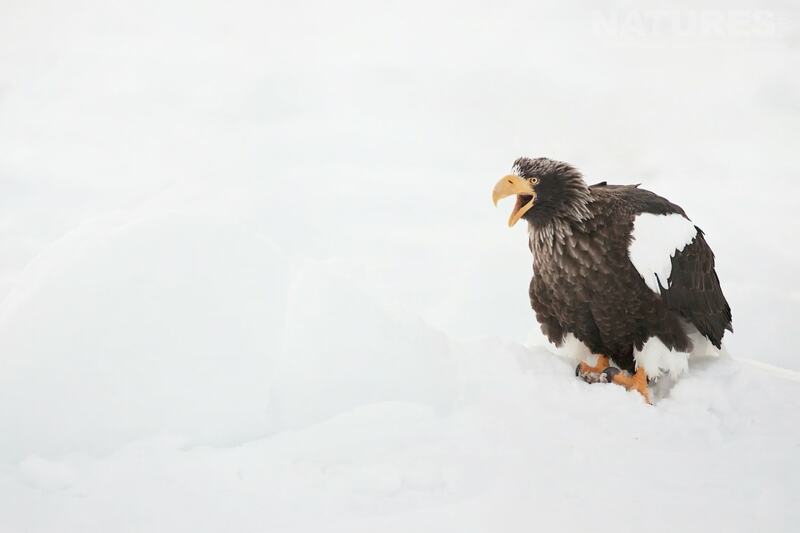 With these eagles, you can expect exciting activity & action photography of this massive raptor; any gathering of eagles in these quantities invariably leads to fights over the additional food set out for them. If we are lucky enough to get snow for our visit, then the fighting can reach frenzied levels & leads to incredible photographic opportunities. Each day, Alan & Boris (our local guide) will get you settled into the hide, light the gas heaters to warm the group, & will then provide any assistance you need to prepare for the day ahead. We would stress that from this point onwards, nobody is allowed to leave the hide under any circumstances until after dark for the reason noted above. It is anticipated that in total the group will spend approx 11-12 hours each day in the hide. Cameras & lenses are moved into position & set up under cover of darkness, we then play a waiting game & get comfortable, anticipating the arrival of the eagles. Previous years sessions conducted by our local guide have shown the general pattern of the day to be the White-tailed Sea Eagles visiting at first light, followed by several frantic hours of action before these birds depart mid-morning – on several days, however, the Eagles stayed virtually all day. In the absence of the White-tailed Sea Eagles, foxes & many other birds are present & provide photographic opportunities; these include raven, hooded crow, magpies, common gull, caspian gull, herring gull, greater black-backed gull & both grey heron & great white egret. Mid-afternoon generally sees the return of the White-tailed Sea Eagles for further feeding; again the action can be spectacular. It should be noted that the White-tailed Sea Eagles activity is very dependent on the weather, the harsher the weather, the better the action is likely to be. Extreme weather is unlikely to be a problem in the heart of Nemunas delta in winter though unless we are incredibly unlucky. As the sun sets & darkness falls, we are collected from the hide & driven back to our lodgings where an evening meal will be served. David & Ian invite you to join them & spend this day tour travelling throughout the wonderfully diverse landscapes of Japan, specifically Central Honshu & Northern Hokkaido, getting up close to a wide range of native species which thrive in harsh winter conditions. Our Winter Wildlife of Hokkaido & Japan photography holiday, which we have been leading for the last 6 years, covers a variety of areas, providing you with unique opportunities to undertake wildlife photography of the highest quality. Guided by David & Ian, you will visit Central Honshu & Northern Hokkaido & gain an insight into the variety of landscapes & wildlife which exists throughout the country, made even more photogenic by dramatic winter conditions. 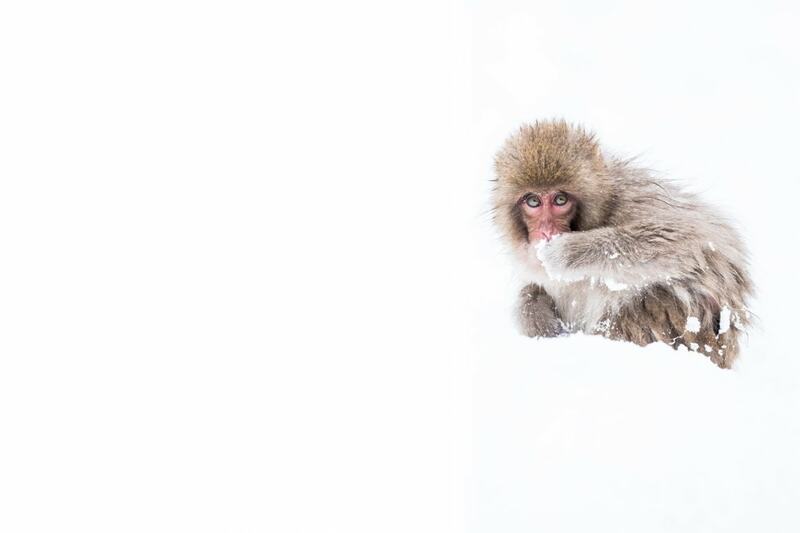 The photographic opportunities on our Winter Wildlife of Hokkaido & Japan photography tour are always without parallel – with opportunities to photograph the red-crowned cranes, Steller’s sea eagles, white-tailed sea eagle, whooper swans, & of course, the Snow Monkeys, during this photography holiday. Join NaturesLens to capture images of varied winter wildlife, in Japan, during the Winter Wildlife of Hokkaido & Japan photography holiday. This photography holiday is of day duration on a Half Board, Non-Shared basis & costs £5749 per participant. 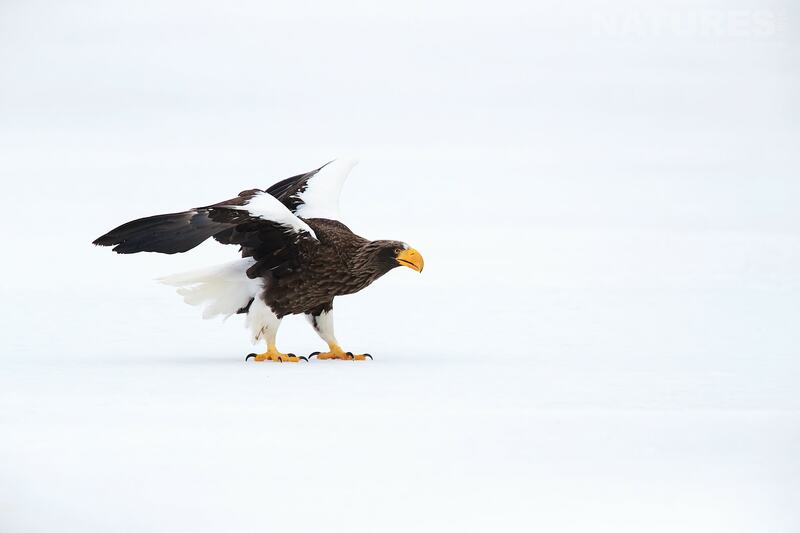 After 5 years of successfully running our tour to capture images of the snow monkeys, the red-crowned cranes, the Steller’s & white-tailed sea eagle on pack ice & the whooper swans on their frozen lake, we have decided to amend our itinerary, we are taking nothing away, we are adding extra days to the photography holiday. Several new days follow on from the second day with the snow monkeys of Jigokudani Yaen Koen, we will travel to Matsumoto, to view & capture images of Matsumoto Castle. Matsumoto Castle is one of five castles designated as ‘National Treasures of Japan’ & the oldest castle donjon remaining in Japan. Our second new location, & now the last stop on our Japanese Winter Wildlife photography holiday is Lake Yamanaka; Lake Yamanaka is located in the village of Yamanakako in Yamanashi Prefecture near Mount Fuji, Japan. Lake Yamanaka is the largest of the Fuji Five Lakes regarding the surface area, & is the highest of the Fuji Five Lakes regarding elevation. Due to its high altitude & its relatively shallow water depth, Lake Yamanaka often freezes completely in the winter. The view of Mt. Fuji across Lake Yamanaka is breathtaking with the mountain forming its distinctive shape – all making for an iconic image. From mid-October to February, a beautiful phenomenon called Diamond Fuji occurs when the rising or setting sun aligns with the peak of Mt. Fuji, causing Mt. Fuji to shine bright like a diamond, hence its name. Winter is the best season to see Mt. Fuji from this location as the weather conditions are more stable & the mountain is covered with snow. Join David & Ian to travel deep into stunning snow-covered landscapes, capturing beautiful images of wildlife which thrives during harsher seasons in Japan. Our group will travel throughout several different regions, including the mountainous area around Yudanaka in central Japan, & north of the mainland to the island of Hokkaido, giving you an insight into the variety of landscapes & wildlife which exists throughout the country, made even more photogenic by dramatic winter conditions. 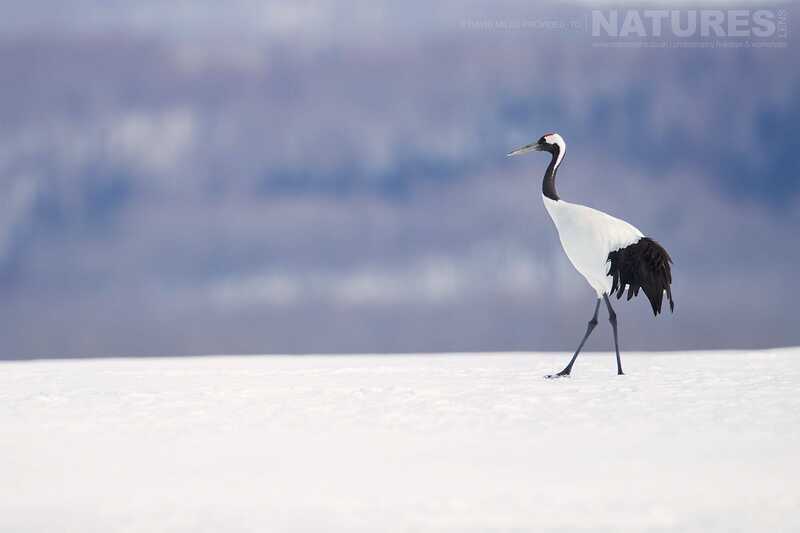 Our trip offers enthusiastic wildlife photographers the opportunity to rise early for two dawn visits to the famous red-crowned crane roosting sites of the Tsurui region of Hokkaido; spend two days at the Akan red-crowned crane feeding centre; & spend two days observing the beautiful whooper swans which inhabit Lake Kussharo, a frozen caldera lake in the eastern region of Hokkaido. 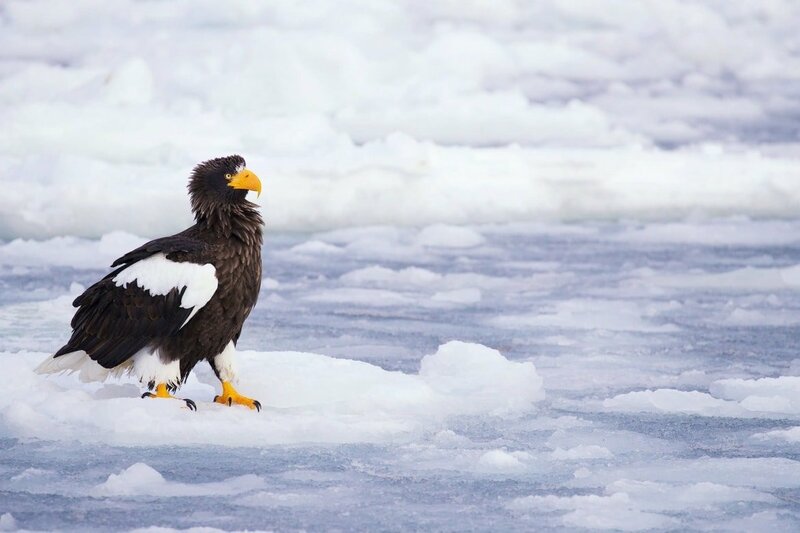 Not only this, but our trip is unique in offering six boat trips on the drift ice of the Nemuro Strait to photograph Hokkaido’s fabulous Steller’s sea & white-tailed eagle populations as they fly, feed, dive for fish & fight over scraps. These excursions will give you unique access to the native wildlife at each location, providing ample opportunity to obtain incredible images. Our tour begins in Tokyo; from there we immediately transfer to Hokkaido, the most northerly island of Japan, which holds the most remote & only true wilderness in Japan. North of the island, the Shiretoko Peninsula is recognised for its world heritage site status, as the landscapes of dramatic coastline & soaring mountains are stunning, giving you the perfect backdrop to achieve editorial quality images of the wildlife inhabitants. As we travel across the island, you will have the opportunity to photograph a vast selection of Japanese Winter Wildlife, including red-crowned cranes, black-eared kites, whooper swans as well as white-tailed & Steller’s sea eagles as we cruise through drift ice environments which surround the island & across additional feeding sites on the Nemuro Peninsula to the east of the island. 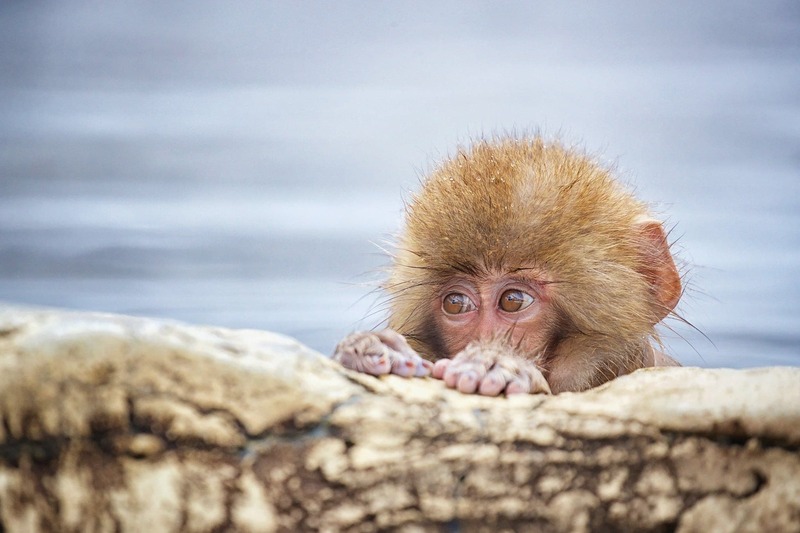 We will then move onward to Yudanaka & spend two days at the Jigokudani snow monkey site with the Japanese Macaque, also known as the Snow Monkey, in the mountains, at their thermal spa, as they bathe & feed in the area. We give you the second day here so that you have the chance to fine-tune your photography having become more familiar with the environment & the behaviour of this species. After spending the morning with the snow monkeys of Jigokudani Yaen Koen, we will travel to Matsumoto, to view & capture images of Matsumoto Castle. Our final location is on the shores of Lake Yamanaka; the view of Mt. Fuji from the lake is breathtaking & has a distinctive shape – making for an iconic image to complete your Japanese Winter Wildlife photography holiday. 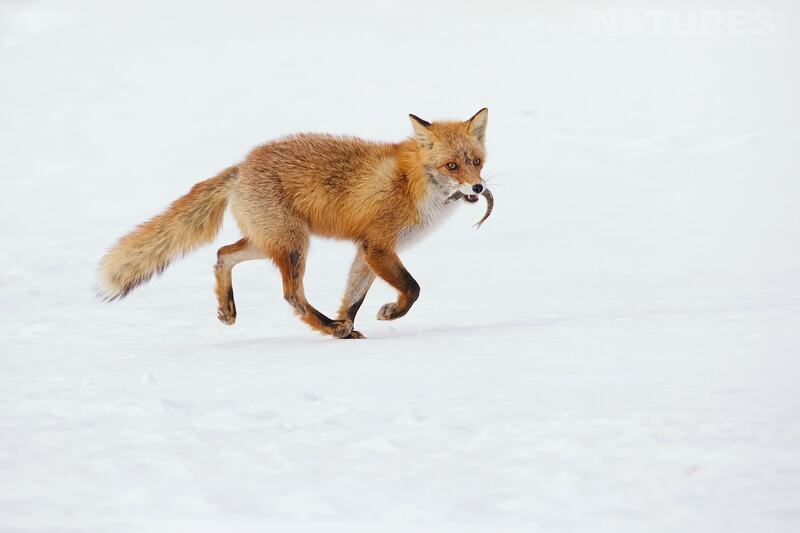 Japan is an extraordinary country, & our Winter Wildlife of Hokkaido & Japan photography holiday provides wildlife photographers with unique opportunities to capture uniquely beautiful photographs. Group size is limited to between 4 & 5 participants, this is due to the nature of the photography excursions & the type of hotel that we prefer to make use of, so booking early is essential. If you are a pair of travelling companions or a couple then you can share accommodation & book two places for £5175 each instead of £5499 per person! Quote JAPANPAIR in the referral code text box to have the discount applied to your booking – you can book now & hold your places with 20% deposit only! Please note, both bookings, for the travelling companions or couple, must be made at the same time & the dates for this trip are 23rd February - 7th March 2020. 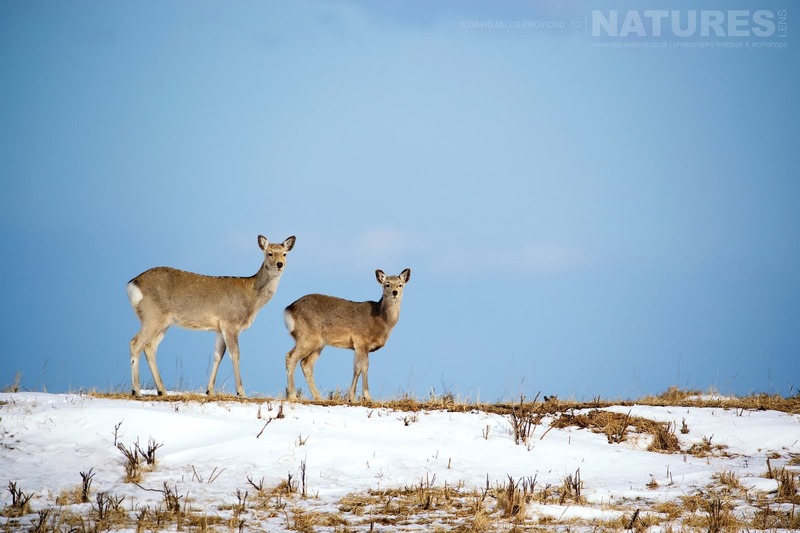 NaturesLens invites you to spend day travelling throughout the wonderfully diverse landscapes of Japan, specifically Central Honshu & Northern Hokkaido, getting up close to a wide range of native species which thrive in harsh winter conditions. The NaturesLens Japanese Winter Wildlife photography holiday, which we have been leading for the last 6 years, covers a variety of areas, providing you with unrivalled opportunities to undertake wildlife photography of the highest quality. Accompanied by David & Ian, you will visit Central Honshu & Northern Hokkaido & gain an insight into the variety of landscapes & wildlife which exists throughout the country, made even more photogenic by dramatic winter conditions. The photographic opportunities on our Japanese Winter Wildlife Photography Holiday are always without parallel – with opportunities to photograph a variety of species including the red-crowned crane, snow monkey, Steller’s sea eagle, white-tailed sea eagle, whooper swan, plus more. Join NaturesLens to capture images of varied winter wildlife, in Japan, during the Japanese Winter Wildlife photography holiday. This photography holiday is of day duration on a Half Board, Non-Shared basis & costs £5499 per participant. Join David & Ian of NaturesLens to travel deep into stunning snow-covered landscapes, capturing beautiful images of wildlife which thrives during harsher seasons in Japan. You will travel throughout several different regions, including the mountainous area around Yudanaka in central Japan, & north of the mainland to the island of Hokkaido, giving you an insight into the variety of landscapes & wildlife which exists throughout the country, made even more photogenic by dramatic winter conditions. This day trip offers enthusiastic wildlife photographers the opportunity to rise early for 2 dawn visits to the famous red-crowned crane roosting site; spend 2 days at the Akan red-crowned crane feeding centre; & spend 2 days observing the beautiful whooper swans which inhabit Lake Kussharo. 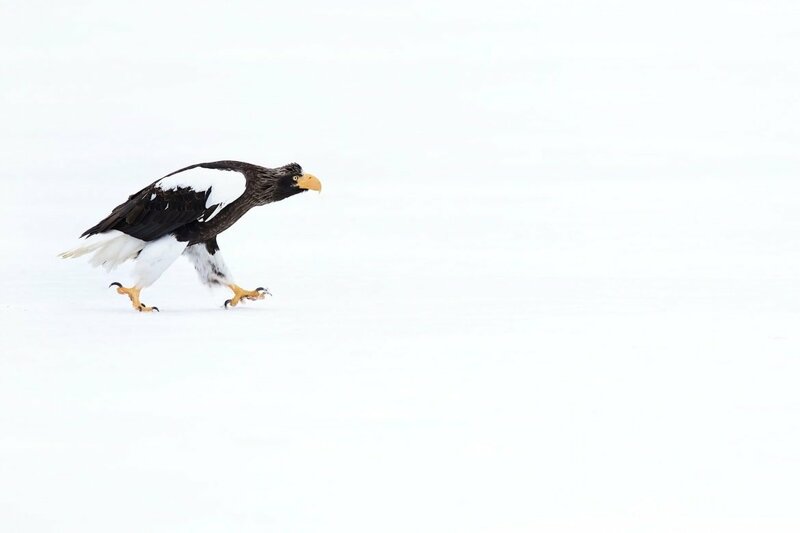 Not only this, but our trip is unique in offering 6 boat trips on the drift ice of the Nemuro Strait to photograph the Steller’s sea & white-tailed eagle populations as they fly, feed, dive for fish & fight over scraps. These excursions will give you unrivalled access to the native wildlife at each location, providing ample opportunity to obtain incredible images. Our tour begins in Tokyo; from there we transfer to Hokkaido, the most northerly island of Japan, which holds the most remote & only true wilderness in Japan. Hokkaido is undoubtedly the star location during our Japanese winter wildlife photography holidays, the North of the island, the Shiretoko Peninsula is recognised for its world heritage site status, as the landscapes of dramatic coastline & soaring mountains are stunning, giving you the perfect backdrop to achieve editorial quality images of the wildlife inhabitants. As we travel across the island, you will have the opportunity to photograph red-crowned cranes, black-eared kites, whooper swans as well as white-tailed & Steller’s sea eagles as we cruise through drift ice environments which surround the island & across additional feeding sites on the Nemuro Peninsula to the east of the island. 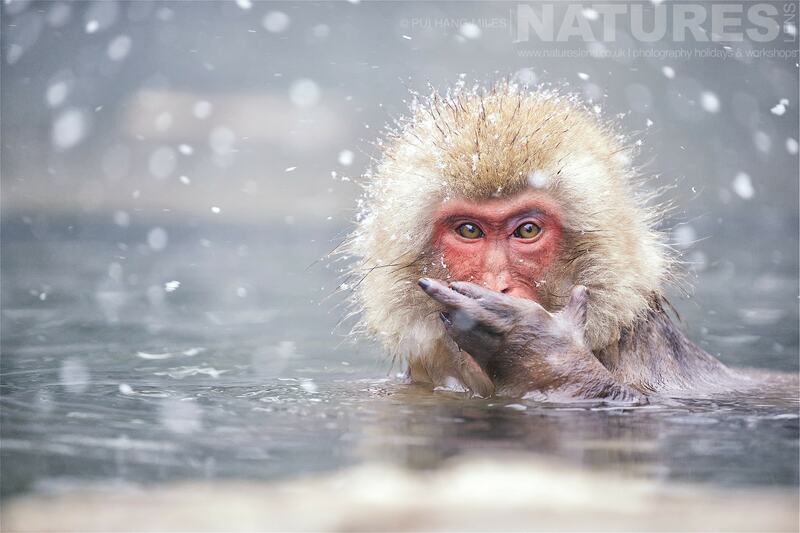 We will then move onward to Yudanaka & spend 2 days at the Jigokudani snow monkey site with the Japanese Macaque, also known as the Snow Monkey, in the mountains, at their thermal spa, as they bathe & feed in the area. Our itinerary is designed to give you the second day here so that you have the chance to fine-tune your photography having become more familiar with the environment & the behaviour of this species. Group size for the Japanese Winter Wildlife photography holiday is limited to 4 participants, this is due to the nature of the photography excursions & the type of hotel that we prefer to make use of, so booking early is essential. NaturesLens invites you to spend this day tour travelling throughout the wonderfully diverse landscapes of Japan, specifically Central Honshu & Northern Hokkaido, getting up close to a wide range of native species which thrive in harsh winter conditions. Our Japanese Winter Wildlife photography holiday, which we have been leading for the last 6 years, covers a variety of areas, providing you with unique opportunities to undertake wildlife photography of the highest quality. Guided by David & Ian, you will visit Central Honshu & Northern Hokkaido & gain an insight into the variety of landscapes & wildlife which exists throughout the country, made even more photogenic by dramatic winter conditions. The photographic opportunities on our Japanese Winter Wildlife photography tour are always without parallel – with opportunities to photograph the red-crowned cranes, Steller’s sea eagles, white-tailed sea eagle, whooper swans, & of course, the Snow Monkeys, during this photography holiday. Join NaturesLens to capture images of varied winter wildlife, in Japan, during the Winter Wildlife of Japan photography holiday. This photography holiday is of day duration on a Half Board, Non-Shared basis & costs £5749 £5499 per participant. Our second new location, & now the last stop on our Japanese Winter Wildlife photography holiday is Lake Yamanaka; Lake Yamanaka is located in the village of Yamanakako in Yamanashi Prefecture near Mount Fuji, Japan. Lake Yamanaka is the largest of the Fuji Five Lakes in terms of surface area, & is the highest of the Fuji Five Lakes in terms of elevation. Due to its high altitude & its relatively shallow water depth, Lake Yamanaka often freezes completely in the winter. The view of Mt. Fuji across Lake Yamanaka is breathtaking with the mountain forming its distinctive shape – all making for an iconic image. From mid-October to February, a beautiful phenomenon called Diamond Fuji occurs when the rising or setting sun aligns with the peak of Mt. Fuji, causing Mt. Fuji to shine bright like a diamond, hence its name. Winter is actually the best season to see Mt. Fuji from this location as the weather conditions are more stable & the mountain is covered with snow. Japan is an extraordinary country, & our Japanese Winter Wildlife photography holiday provides wildlife photographers with unrivalled opportunities to capture uniquely beautiful photographs. 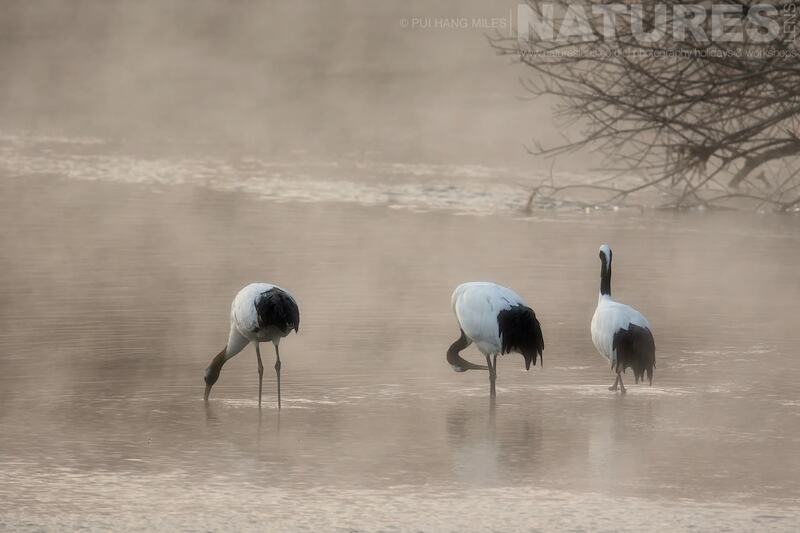 Join NaturesLens to capture images of varied winter wildlife, in Japan, during the Winter Wildlife of Japan past event. This past event is of day duration on a Half Board, Non-Shared basis & costs £5499 per participant.